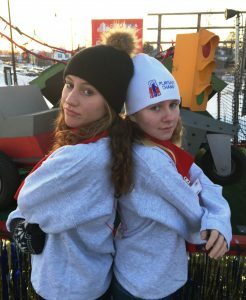 MONCTON, November 26, 2018 – Danielle Dorris (left), 16, of Moncton, and Carly Smith (right), 15, of Ammon, joined The War Amps float in the Santa Claus Parade on Saturday, to pass on the vital PLAYSAFE/DRIVESAFE message, but also to commemorate a special milestone for the Association – its 100th anniversary. The Association was started by amputee veterans returning from the First World War to provide each other with support. Today, The War Amps continues to assist war amputees, and all amputees, including children. Danielle, born a double arm amputee, and Carly, born a left arm amputee, are members of The War Amps Child Amputee (CHAMP) Program. Through their role as Safety Ambassadors, they encourage other kids to be aware of the dangers in their play environments. Danielle and Carly are well qualified to pass on the PLAYSAFE message as they know what it is like to live without a limb and have met children who have lost limbs in accidents. In addition to parades, The War Amps is spreading the safety message through a new video, PLAYSAFE: Don’t Let It Happen to You, in which eight young amputees share their stories about how they lost their limbs in accidents and warn other children to spot the danger before they play. It can be viewed free-of-charge online at waramps.ca/playsafe and is a valuable resource for families, educators and community groups.